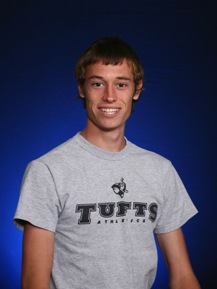 WILLIAMSTOWN -- Senior tri-captain Dave Sorensen (Dover, MA) finished ninth overall to lead the Tufts University men's cross country team to a fifth place finish out of 11 teams at the 2007 NESCAC Championships held at Mount Greylock High School on Saturday afternoon. The Jumbos finished with a score of 128, behind first-place Williams (47), Amherst (86), Bowdoin (98) and Trinity (109). The race took place under rainy conditions with moderate-to-heavy winds. The wooded sections of the course were muddy and slick. Peter Kosgei from Hamilton College won the race by a significant margin with his 25:52 time. Sorensen completed the eight-kilometer run in 26 minutes, 41 seconds, and he was trailed closely by sophomore teammate Jesse Faller (Burlington, MA), who came in 12th place with a 26:43 time. Also finishing in the top 30 among 127 total runners in the race was senior tri-captain Chris Kantos (Apple Valley, MN), who was 30th crossing the finish line in 27:17. Sophomore Nick Welch (Seattle, WA) was the fourth Tufts scorer in 35th place overall with a time of 27:33. Freshman Greg Pallotta (Syracuse, NY) ran a 27:47 for 46th place as the final Tufts scorer.